It depends on what you put into the salad mix. If you’re going to add boiled eggs, it’s going to take a little longer. I prefer Miracle Whip Lite, but you can use any mayonnaise or dressing spread. Place 4 eggs into a pot and cover with water. Cook to a boil for 30 – 40 minutes. When cooked, remove the eggs, cover with cold water and set aside. Drain tuna and place into a large microwave safe mixing bowl. Cook for 15 to 30 seconds in the microwave. He did this just to warm up the tuna a little. Drain the pineapple and add it into the bowl. Cut about 6 sweet gherkins and add them to the mix. Add desired amount of miracle whip and mustard. (About 2 tablespoons of mayo and 1 tablespoon of mustard). Peal the hard-boiled eggs and rinse any extra shell from the eggs. Don’t worry about how they look, you’re not fixing deviled eggs. Slice the hard-boiled eggs and place them into the mix. Serve on a leaf of lettuce with crackers. Or, Serve on toast with cheese and lettuce for a tasty sandwich. Switch out the sweet gherkins for 2 dill pickles, and add 1 tablespoon of dill juice to the mix. Dice half an onion and a couple of stalks of celery to add some color and flavor to your tuna mix. Lightly toast your favorite sliced bread, to make a sandwich. Try it on sourdough, it’s yummy. If you make a sandwich, try adding 2 slices of crisp bacon and a tomato. Slice a large croissant and place it on a cookie sheet. 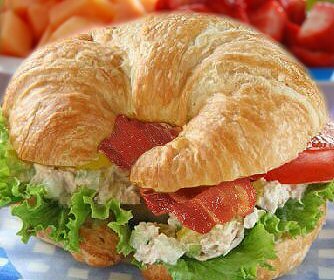 Dish out a scoop or two of tuna salad onto one slice of croissant. 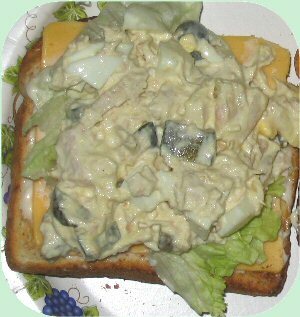 Then top the tuna with a slice of your favorite cheese. Toast the sandwich in the oven on 350 for about 10 minutes. Place a tomato on the bare slice of croissant. Top it with a leaf of lettuce. Add 2 slices of crisp bacon on top of the cheese side of the sandwich.